We also offer many combined bachelor’s-to-master’s degree programs. Daemen is a private college of national distinction. 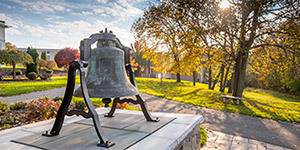 Located in Amherst, New York, ranked one of the safest cities in America, our attractive campus offers access to metropolitan Buffalo and the scenic outdoor recreation areas of Niagara and the Great Lakes. 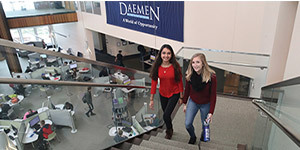 Approximately 1,700 undergraduate students and 900 graduate students attend Daemen. 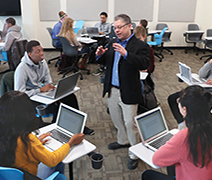 Daemen offers small class sizes, giving students confidence to participate. Students work closely with faculty on original work, whether it’s an art project or scientific study. With support from faculty, motivated students learn to see the world differently. Daemen offers tailored programs that enable you to pursue your interests while providing a well-rounded education for the real world. Enhance your education through our Three Degrees in Five Years programs, +Plus Programs, and academic minors. Develop your skills through study abroad, service learning activities, internships, field placements, and clinical assignments. Our students make a difference in the health care community. Many of our programs exceed the national averages with success rates on national exams. Pre-medicine, Pre-pharmacy, and Pre-veterinary offer unique placement opportunities. Significant projects are funded through the Student-Faculty Interdisciplinary Research Think Tank. Many students present at conferences, gaining valuable presentation skills and networking opportunities. Daemen is an NCAA Division II member of the East Coast Conference. Wildcat Athletics sponsors 18 teams, including men’s and women’s basket-ball, cross-country, soccer, tennis, track & field (indoor and outdoor), and volleyball; men’s golf; and women’s bowling, cheerleading, and triathlon. Daemen provides recreation and intramural programs for all students.